Sotheby's diamond department head Patti Wong called it "over 100 carats of flawless perfection"
A 102.34, carat, D colour and flawless white diamond held by a model is displayed at Sotheby's auction house in London, Thursday, Feb. 8, 2018. 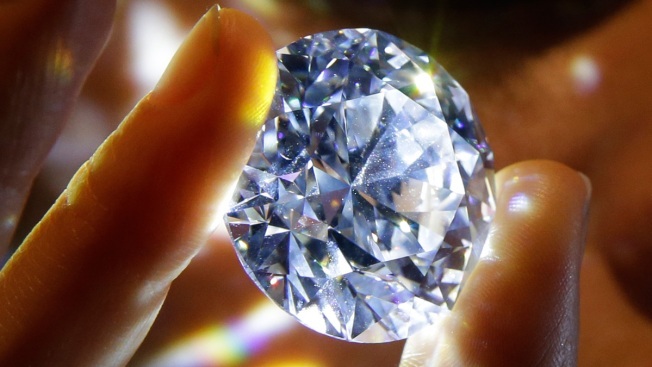 The diamond is the world largest known round brilliant diamond to have achieved "perfection in all critical criteria - Colour, Clarity, Cut and Carat", and is expected to reach considerably over 33.7 million dollars by private sale in London. A white diamond billed as the largest and purest of its type to come to market is expected to sell for well over $33 million.